Iraq’s parliament passes law legalising Shia militias: the end of Iraq? (By Osservatorio Mashrek) Rekindling sectarian rivalries at a sensitive time, Iraq’s parliament on Saturday voted to fully legalize state-sanctioned Shiite militias long accused of abuses against minority Sunnis, adopting a legislation that promoted them to a government force empowered to “deter” security and terror threats facing the country, like the Islamic State group. The legislation, supported by 208 of the chamber’s 327 members, was quickly rejected by Sunni Arab politicians and lawmakers as proof of the “dictatorship” of the country’s Shiite majority and evidence of its failure to honor promises of inclusion. “The majority does not have the right to determine the fate of everyone else” Osama al-Nujaifi, one of Iraq’s three vice presidents and a senior Sunni politician, told reporters after the vote, which was boycotted by many Sunni lawmakers. Another Sunni politician, legislator Ahmed al-Masary, said the law cast doubt on the participation in the political process by all of Iraq’s religious and ethnic factions. “The legislation aborts nation building” he said, adding it would pave the way for a dangerous parallel to the military and police. A spokesman for one of the larger Shiite militias welcomed the legislation as a well-deserved victory. “Those who reject it are engaging in political bargaining” said Jaafar al-Husseini of the Hezbollah Brigades. “It is not the Sunnis who reject the law, it is the Sunni politicians following foreign agendas” said Shiite lawmaker Mohammed Saadoun. The law, tabled by parliament’s largest Shiite bloc, applies to the Shiite militias fighting IS as well as the much smaller and weaker anti-IS Sunni Arab groups. Militias set up by tiny minorities, like Christians and Turkmen, to fight IS are also covered. According to a text released by parliament, the militias have now become an “independent” force that is part of the armed forces and report to the prime minister, who is also the commander in chief. The new force would be subject to military regulations, except for age and education requirements — provisions designed to prevent the exclusion of the elderly and uneducated Iraqis who joined the militias. The militiamen would benefit from salaries and pensions identical to those of the military and police, but are required to severe all links to political parties and refrain from political activism. 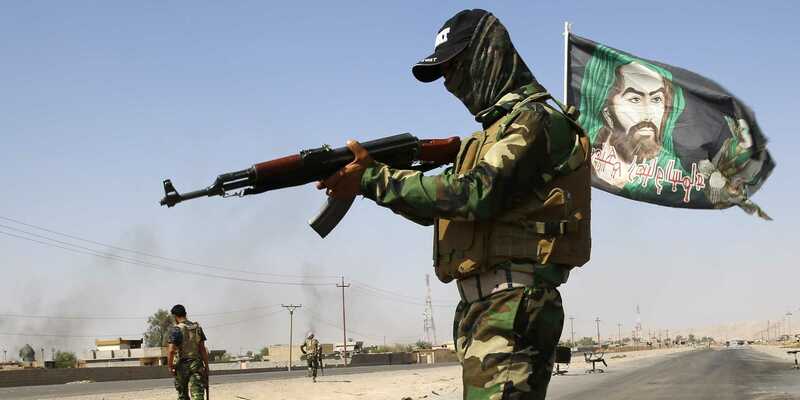 The legislation came at a critical stage in Iraq’s two-year-long fight against IS, a conflict underscored by heavy sectarian tensions given that the group follows an extremist interpretation of Sunni Islam and the security forces are predominantly Shiite. The Shiite-led government last month launched a massive campaign to dislodge IS from predominantly Sunni Mosul, Iraq’s second largest city and the last major urban center still held by the extremist group. Through the military, the government has used the campaign to project an image of even-handedness, reaching out to the city’s residents and promising them a life free of the atrocities and excesses committed by IS. It has also excluded the Shiite militias from the battle, winning a measure of goodwill from the Sunnis.But Saturday’s legislation may stoke the simmering doubts of many Sunnis about the intentions of the government. The Shiite militias, most of which are backed by Iran, have been bankrolled and equipped by the government since shortly after IS swept across much of northern and western Iraq two years ago. Many of them existed long before IS emerged, fighting American troops in major street battles during the U.S.military presence in Iraq between 2003 and 2011.Their ranks, however, significantly swelled after Iraq’s top Shiite cleric, Grand Ayatollah Ali al-Sistani, called for jihad, or holy struggle, against IS in June 2014. They now number over 100,000 men and fight with heavy weaponry, including tanks, artillery and rocket launchers. The larger militias have intelligence agencies and run their own jails.Since 2014 they have played a key role in the fight against IS, checking its advance on Baghdad and the Shiite holy cities of Samarra and Karbala and later driving the militants from areas to the south, northeast and north of Baghdad. Their heavy battlefield involvement followed the collapse of security forces in the face of the 2014 IS blitz, but their role has somewhat diminished in recent months as more and more of Iraq’s military units regained their strength and chose to distance themselves from the occasionally unruly militiamen. Iraq’s Sunni Arabs and rights groups have long complained that the militiamen have been involved in extrajudicial killings, abuse and the theft or destruction of property in Sunni areas. They viewed them as the Trojan Horse of Shiite, non-Arab Iran because of their close links to Tehran and their reliance on military advisers from Iran and Lebanon’s Hezbollah. Many in the Sunni Arab community wanted them integrated into the military and police, a proposition long rejected by Shiite militia leaders, some of whom have on occasion spoken of their aspiration of evolving into a force akin to Iran’s Revolutionary Guards or the Iranian-backed Hezbollah — both well-armed military groups with substantial political leverage and large economic interests. Senior Shiite politician Amar al-Hakim sought to reassure Sunnis on Saturday, saying several laws to be issued by the prime minister to regulate the work of the militias would allay many of their fears. In a statement, Prime Minister Haider al-Abadi welcomed the legislation and said the “Popular Mobilization Forces” — the formal name of the militias — would cover all Iraqi sects: “We must show gratitude for the sacrifices offered by those heroic fighters, young and elderly”. But Sunni lawmaker Mohammed al-Karbooly said the law ignored pleas by Sunni politicians for the expulsion and prosecution of Shiite militiamen accused of abuses. “The law, as is, provides them with a cover,” he said.